Hey everyone! If you are planning a trip to Nicaragua that includes San Juan del Sur, don’t miss out on this awesome e-book. Written by two highly knowledgeable expats (nope, not us) who have lived in and visited San Juan del Sur for years, this guide offers comprehensive information on everything from the best hotels to not-to-miss activities. Baby Gear Rental Business in San Juan del Sur! It’s been a while since I’ve posted, but that’s because I’ve been busy developing my latest business venture: Mums and Bums Nicaragua – a baby gear rental shop for those of you visiting San Juan del Sur, Nicaragua with families! My good friend and business partner, Rosi, and I are super excited to introduce this new business to Nicaragua. Please visit and like our Facebook page: https://www.facebook.com/mumsandbumsnicaragua to learn more and to stop abreast of new products for rent, upcoming promotions, and more! We can also arrange for babysitting services (with licensed early childhood development professionals). More great products and services coming soon! Help us to fund a new school campus in Nicaragua! As most of you know, in 2008, Justin and I set out on a journey to Nicaragua. What began as an extended honeymoon has turned into so much more – San Juan del Sur, Nicaragua has become our home and more importantly, it is now home to our two children: Lucinda and Theodore. In 2009, our dear friend, Julie Speier, opened the doors to a small ½ day preschool. 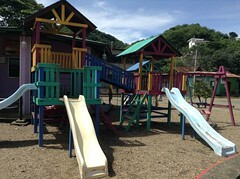 Five years later, San Juan del Sur Day School has developed into a pre-k thru grade 2 International English School, educating expatriate and Nicaraguan children. Julie’s vision does not end there. By the year 2020, she hopes to have a fully operational Pre-k thru grade 12 school. Our own daughter, Lucinda, has been attending the school for over a year now. Each morning, before she has even cleared the sleep from her eyes, she inquires as to whether or not she has school that day. She is often ready to depart for school a full hour before the lights have been turned on and the doors opened. We delight in seeing our daughter take so much joy in learning. And while she may not realize it quite yet, we know that she is already establishing the foundation for her education. Some time next year, Theodore will also join his cohorts, perhaps becoming a member of San Juan del Sur Day School’s graduating class of 2031! Due to its exponential growth, San Juan del Sur Day School is quickly outgrowing its current location. Fortunately, the school recently received an incredibly generous donation of 30 acres of land upon which to make the dreams of San Juan del Sur Day School a reality. Now, it is time to begin raising the funds to build those dreams. Julie has played such a huge part in our lives, acting not only as schoolteacher and friend, but also as doula at the birth of both of our children. Her commitment to the wellbeing of our children and those of San Juan del Sur is profound. Now we can play a big part in her life and the lives of our children. Below, you will find detailed information on the school and how to donate. Please consider making a donation to the construction fund for San Juan del Sur Day School. Every donation counts. Thank you so much for taking the time to read this and for being such wonderful people in our lives. Feel free to share and forward this to others who might be interested in helping. San Juan is now proud to boast its first ever rugby team. A collection of Nicaraguans and Expats, residents and backpackers, young and old, the team played in its second official tournament earlier this month in Managua. 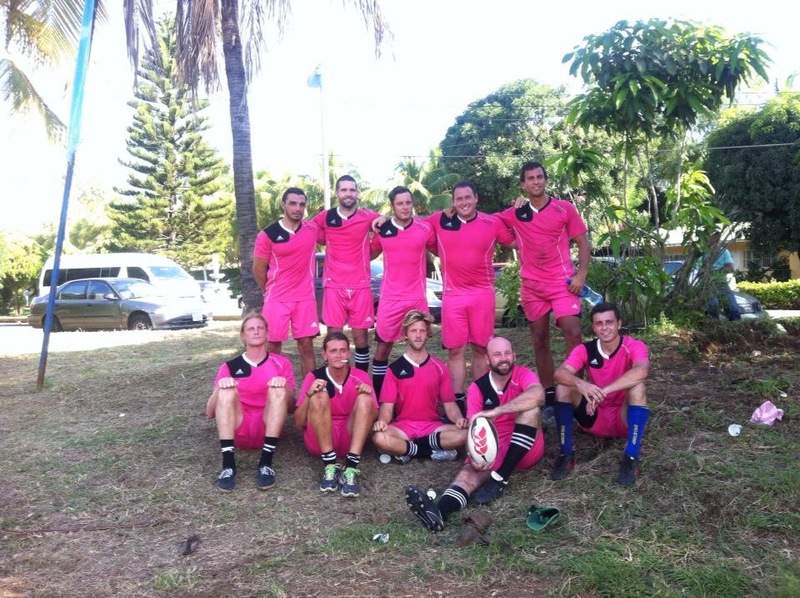 This weekend was the first clash in the Nicaraguan Rugby 7′s Circuit and the team from San Juan del Sur did not disappoint, winning the tournament and all four matches by healthy margins. Also noted was San Juan’s sartorial elegance–bright pink uniforms! Five teams are competing on the 7′s Circuit, which will be played over four more weekends in the coming months with the next round in Managua on October 26th. San Juan beat Chorotega (MGA) 36-5, then defeated Los Lobos de la UNEN (MGA) by the same score. Next up was the toughest win against Managua 19-5 and finally a sound 20-0 thumping over Granada. Marc Noonan (UK) won the MVP of the tournament after scoring five tries. Bastien Mahe (France) and Brett Ross (Australia) were also major contributors to the offensive onslaught. The San Juan club is actively looking for members, especially local Sanjuaneños. All ages and levels of experience are welcome. Rugby 7′s is now an Olympic sport and the Nicaraguan national side will be selected from players on the Circuit. Please visit San Juan del Sur Rugby Club page on Facebook if you want to come and learn how to play. Or contact Justin Fahey at 8810-1112 or Email: fahey.justin@gmail.com. Note: The information provided in this post is intended for your general knowledge only and is not a substitute for professional legal advice. An Expat Life in Nicaragua does not endorse nor control or take responsibility for the content or information on any external website listed here. © Sarah Fahey and An Expat Life in Nicaragua, 2008-2013. Unauthorized use and/or duplication of this material without express and written permission from this blog’s author and/or owner is strictly prohibited. Excerpts and links may be used, provided that full and clear credit is given to Sarah Fahey and An Expat Life in Nicaragua with appropriate and specific direction to the original content. The information provided on this blog is intended for your general knowledge only and is not a substitute for professional legal advice. 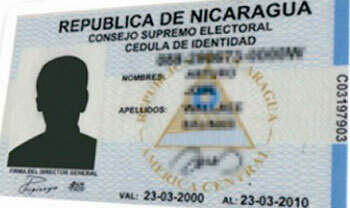 An Expat Life in Nicaragua does not endorse nor control or take responsibility for the content or information on any external website listed here.